Thank You!…for your inquiry into our design and planning services. Please take a few minutes and read our design services work scope outlined below in order to be more familiar with the benefits of great design! This introduction will be referencing several of our website’s linked web-pages in order to provide you with additional information about our planning efforts. These links will further explain our focused efforts at defining your outdoor living environment expectations on your plans. Each link will be a blue bolded underlined heading of which you can “click” upon, in order to go to the subject specific appended informational. Use your Browser’s back arrow key to return to this page. This is a sample Plot Plan showing some of the possible mandated property restrictions i.e. 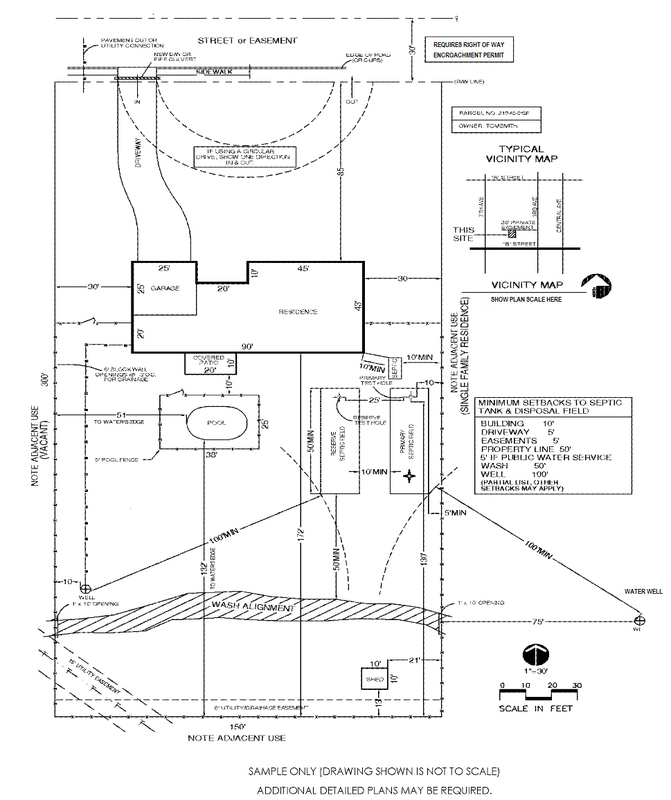 Public Utility Easement (PUE), Pool Building Set-Backs, etc.. 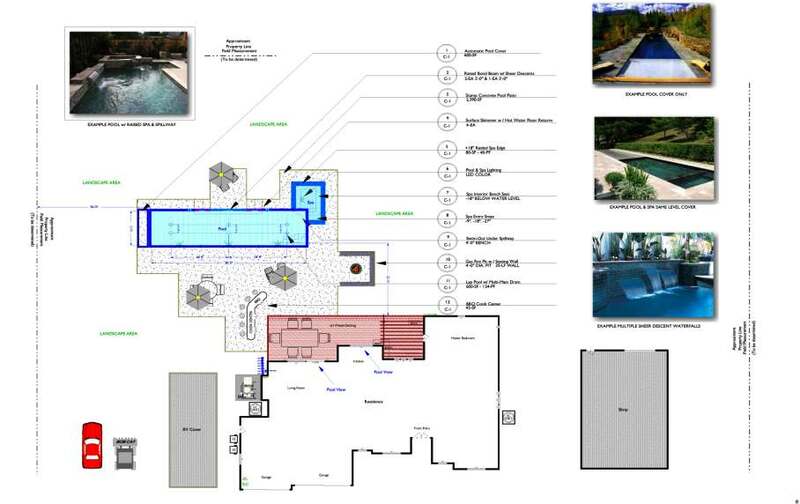 The “Proposed Pool / Spa Area” is denoted in blue and the selected pool / spa shape can be drawn upon a revision of your Plot Plan, as you will indicate on the form below what is applicable and according to the available space and sizing proportional dimensions. This is a document that provides us with referenced information for several aspects of your lot i.e. Building Set-Backs, Public Utility Easements, Lot Dimensions, Etc., and other elements that can restrict the space available for building. In order to correctly exhibit any proposed development we must first familiarize ourselves with the existing conditions and any of the restrictions that pertain so that the proposed development does not conflict with the conditional use of your property. Our design fee structure is based on 2% of our Estimated Retail Construction Value (ERCV) for your project. We use our multi-generational experience in construction to equate a value for the size and scope of your project. The design fee does not include structural and or geotechnical engineering, as the structural engineering will be Boiler Plate or Site Specific for the conditions of construction being proposed and can’t be quoted until the preliminary design has been completed. Our approach to planning an outdoor living environment involves a few sequential steps for getting your ideas and our knowledge and experience rolling on the same page.